Women who initiate the first move on dating apps tend to end up with better prospects (relatively speaking), according to a study by OKCupid. 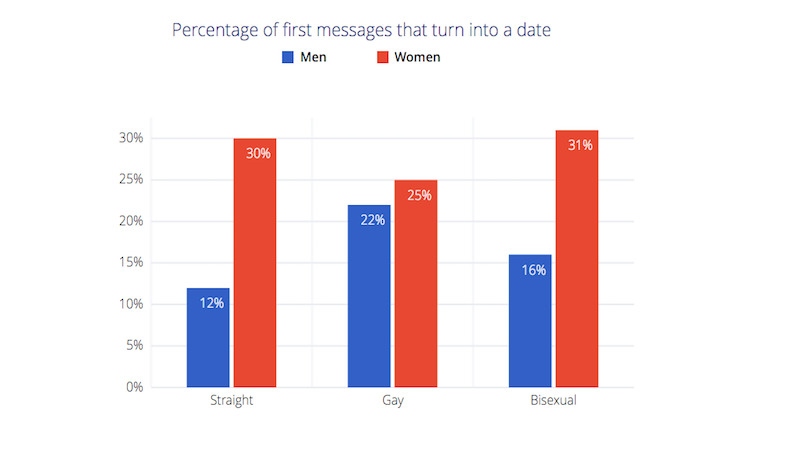 These results come from analyzing the activities of 70,000 users and finding that straight women who shoot off that crucial opening message are, according to this New York Times piece, “2.5 times more likely to receive a response than men who did the same.” The women are also uniformly messaging the site’s hottest dudes, as judged by user standards. Yeahhh buddy. OkCupid, which said it has 1.5 men for every woman on the site, said both men and women are aspirational in whom they approach — men send messages to women 17 percentage points more “attractive” than themselves, while women send messages to men 10 percentage points higher. So a woman who simply sifts through her inbox is most likely fielding entreaties from men less attractive than she is, while she’s most likely to get a response if she contacts a more attractive man. This means “There he is...” could be the start of a beautiful relationship. Would be great to see this study replicated with different apps to see how Tinder or Match.com are different. About 12 percent of first messages men send turn into a date, while 30 percent of women’s first messages end up in a date, the site said. And yet, men send 3.5 times as many first messages on OkCupid as women do. So: messages are turning into dates, but whether these dates become a relationship is unknown, just like dating in general. Carry on.